1989 dark chestnut tobiano Stallion. Live show winner, excellent bloodlines tracing to Mr. Gunsmoke, Far Ute Keno and Zippo Pine Bar 2x. Bred by Painted Pony Ranch. 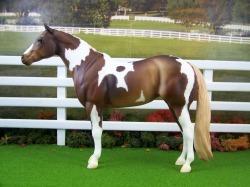 1990 dapple buckskin Overo Paint Stallion. Many times champion halter and performance. Top lines including Hot Scotch Man and Diamond Jim. 1990 black tobiano Paint Stallion. Limited showing, good results. Sire of Champion Foals. Pedigree to Bar Twos Heir, Sailing Moon and Spanish Clipper. Bred by Thundervalley Farm. 1992 bay tobiano Paint Stallion. Limited showing, excellent pedigree tracing to Hollywood Smoke and Silky McTavish. Bred by Double Hart Ranch. 1994 bay overo Paint stallion. Limited showing, excellent results. Bloodlines tracing to Skipa Star Jr, Sonny Go Lucky and Renos Peppy Doc. Bred by WMHS. 1996 grey tobiano stallion. Limited showing. Excellent bloodlines with crosses to Painted Lasan, Sky High Leo and Peppy San Badger. Bred by Persimmon Hill. 1998 chestnut tovero Paint stallion. Shows as a hunter type Pinto. Many times champion/Grand Champion. 2014 MIJC Non-Japan National Champion, and 2 time 2015 MIJC National Champion! Excellent pedigree tracing to greats like Sacred Indian, Gambling man and Skips Lad. Bred by Cory Hartung/Double Hart Ranch. 2001 red roan sabino overo Paint Stallion. Double registered as a hunter type Pinto. Multi Champion, Grand champion, bloodlines to Seattle Slew, Sir Ivor and Jetalito. Bred by Double Heart Ranch/Cory Hartung. 2005 palomino sabino/splash Overo Paint Stallion. Unshown. Bloodlines to Nu Chex to Cash, Far Ute Roulette and Genuine Doc. Bred by Cindi Nakagawa/Indigo Creek. 2007 black tobiano stallion. Many times champion Halter foal, multiple YEA winner. bloodlines to Kenos Jackpot, Far Ute Keno and Sailing Lonely. Real time bred Foxfire foal so has permanent foal body. 2007 buckskin tobiano Stallion. Live show winner. Bloodlines tracing to Mariachi Bars, Sonny Bar Dee and Smart Chic Olena. Bred by Kay Myers/Caballos Del Mar. 2009 bay tobiano Stallion. Limited showing, bloodlines tracing to Streakin Six, Jumpin Joe Flash and The Hot Express. Bred by Kay Myers/Caballos del Mar. 1991 bay tobiano mare. Unshown, lovely working bloodlines tracing to Dry Doc, Cutter Bill and Peppy San Badger. Bred by Carolyn Spracklin. 1991 chestnut overo mare. Unshown, great working bloodlines tracing to Zan parr Jack, Diamond Jim and Poco Dell. Bred by Carolyn Spracklin. 1993 Bay Overo Mare. Live show Champion. Excellent Lines. 1993 sorrel Overo Paint Mare. Limited showing with good results. Excellent lines including Jet Bar Leo, Ratchett and Mardelle Dixon. 1994 bay tobiano Paint Mare. Unshown, great bloodlines including Hot Scotch Man, Gambling Man and One Tuff Wiz Kid. Bred by Ber Ali Farm. 1994 chestnut tobiano Paint Mare. Unshown, bloodlines to Peppy San Badger, Doc O’Lena, Q Ton Eagle and Leo san Siemon. Bred by Persimmon Hill. 1994 chestnut tobiano Paint Mare. Live show winner, currently unshown in photo shows. Bloodlines trace to Skipa Star Jr, Sonny D Executive and The Big Investment. Bred by Cory Hartung/Double Hart Ranch. 1996 black overo mare. Unshown, great foundation breeding tracing to Peppy san Badger, Top Smoke, Peonita and Colonel Freckles. Bred by Carolyn Spracklin. 1996 bay tobiano Mare. Currently unshown. Pedigree traces to Yellow Mount, Driftwood and Do O'Lena. Bred by Lake Hill Ranch/Jean Sorensen. 1997 bay Tobiano Paint Mare. Unshown. Lines include Continental King, Joe Cody and Driftwood. Bred by Coldspring Farm. 1997 red dun overo Paint mare Unshown. Bloodlines trace to Delta Flyer, Two Eyed Jack and Zippo Pine Bar. Bred by Persimmon Hill. 1998 Palomino Tobiano Paint Mare. Limited showing. Bloodlines include Inheritance, Joe Cody and Mocha Cutter. Bred by Hidden Valley Stables. 1998 grulla overo mare. LSP, photo show halter champion. Very good old paint lines tracing to Barlink Macho Man, Kenos Jackpot and Louie Blue. Bred by Me-Dow Stables. 1998 chestnut Tobiano Mare. Unshown, bloodlines tracing to Mr. Gun Smoke and Sacred Indian. Bred by Painted Pony Ranch. 1999 chestnut overo mare. Champion halter mare. Bloodlines tracing to Jet In Color, Ratchett and Kenos Perfection. 2000 chestnut overo mare. Photo show placed, live show placed. Pedigree traces to Painted Tru Tru, Blazing Hot and Sonny Dee Bar. Bred by Double Hart Ranch/Cory Hartung. 2000 red dun tobiano mare. Unshown, bloodlines to Montana Doc, Impressive 73, and Sonny Dee Bar. Bred by Tracy McDavid/Sparrow Valley Stables. 2001 grey tobiano Paint mare. Champion halter mare, nice pedigree tracing to Azure Deck, Deacon Solano and Skippa Verse. Bred by Randa Garrett. 2002 grulla overo Paint mare. Excellent halter mare with great working lines. Bloodlines to Investment Zippo, Hollywood Blonde, and Doc O'Lena. Bred by kay Myers/Caballos Del Mar. 2002 bay tobiano Paint Mare. Unshown to date, excellent pleasure lines tracing to Invitation Only, Sir Norfleet and The Big Investment. Bred by Cindi Nakagawa/Indigo Creek. 2003 red dun tobiano mare. Currently unshown, bloodlines to Justa Nother Dunnit, Ratchett and Sir Norfleet. Bred by Cindi Nakagawa. 2006 black tobiano mare. Unshown, nice working/pleasure lines tracing to Zippo Pine Bar, and Cowboy Spook. Bred by Barbara Daily/Double D Ranch. 2007 chestnut tobiano mare. Limited showing with good results. Bloodlines to Far Ute Keno, Skipper W and Zippo Pine Bar. Real time bred Foxfire foal so has permanent foal body. 2008 black tobiano mare. Limited showing, good lines tracing to Scotch Leo, Scotch Bar Time and Sonny Dee Bar. Real time bred Foxfire foal, so has a permanent foal body. 2008 black overo mare. Limited showing. Bloodlines to Skipa Star and Barlink Macho Man. Real time bred Foxfire foal, so has a permanent foal body. 2008 bay tobiano mare. Unshown, bloodlines to Yellow Mount, Far Ute keno and Mr Gunsmoke. Real time bred Foxfire foal, so has a permanent foal body.